The Numismatic collection of the Mdina Cathedral Museum is the only major collection of coins found in Malta available for public viewing. It is arranged into four historical periods: Ancient Malta, which includes Carthaginian, Greek, and the Romano-Maltese coinage together with the Roman coins; the Medieval period, starting with Eastern Roman, Arab, Norman, Swabian, Angevin and Aragonese/Spanish coinage; the period of rule the Military Order of St. John in Malta between 1530 and 1798; and finally British rule, through Independence and up to the present day. The coins are exhibited from within seventeen showcases located around the hall and four other showcases in the center. Most of the display cases containing the coins have an enlarged photograph of some specimens, accompanied by both informative text and historical maps for context. The presentation is displayed in a chronological sequence and begins with the Carthaginian coins minted between the 4th century B.C. and 146 B.C., followed by the very fine Romano-Maltese collection of coins minted in the Maltese Islands, on both Melita and Gaulos between 212 B.C. and 35 B.C., during Republican Roman rule. Showcase No. 3 displays a wide selection of Greek coins, covering those of Hellenic colonies and city-states in Magna Graecia. Showcase No. 4 displays Greek coins mostly of the Diadochi, that is, the Hellenistic Successor states which emerged after the death of Alexander the Great. The Roman period begins with Republican coins in showcase No. 5, followed by an important collection of Imperial Roman coins displaced in seven separate showcases, numbered from No. 6 to No. 12. Nearly all the Roman emperors together with their families are represented up until 411 A.D. The coins of Medieval Malta are displayed in showcases Nos. 13, 14 and 15, namely: the coinage in use during Eastern Roman rule between the years 533 and 870; a small selection from the Arab Period between 871 and the arrival of Roger of Hauteville in 1091; Norman rule from 1091 until 1194; the Swabian period from 1194 to 1266, Angevin rule from 1266 to 1282; the Aragonese period from 1283 until 1479; and Spanish rule from 1479 until 1530. Although between the years 870 and 1530 no coins were minted in Malta, throughout this period the Maltese were using the coinage of their foreign rulers. Coins of these rulers have been found in Malta. An important collection of Papal coins and medals are displayed in the last two showcases, Nos. 16 and 17. In 1530, Emperor Charles V of Spain donated the Maltese Islands and the Fortress at Tripoli to the Military Order of St. John of Jerusalem, who would go on to rule the islands for 268 years, until 1798. The Order began to mint their own coins soon after they began to administer Malta. The coins of the Order are displayed in three centrally-placed showcases. It is to be noted that most of these coins are rare and historically indispensable finds. 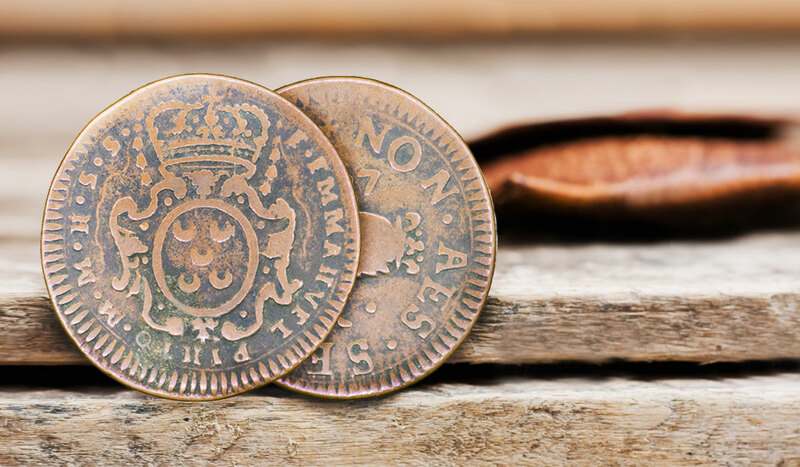 The collection extends to coins circulating during British Colonial rule, from 1800 until 1964. The coins of the Republic of Malta, minted from 1971 (when the Maltese Government started to issue its own currency) up until the present day, known as the “Central Bank Issues”, are displayed in the room prior to entering the Numismatic Hall.